I'm the umpteenth Chicago lifestyle blogger. But Iâ€™m worse, because my "fashion" sense includes Target t-shirts and my makeup skills involve being as bare-faced as possible. What I am is a twenty-something that is trying to learn all the tips and tricks to living life to the fullest. This blog is a chronicle of the adventures and lessons life throws at me. I grew up in Italy and Spain and moved to Chicago five years ago. I learned how to ride the bus this month and am looking for the perfect falafel. Give me your recommendations and I will let you pet my cat, Tyrion Lannister. My pictures aren't perfectly edited but neither is this story. This is how it feels to be young and confused in Chicago. 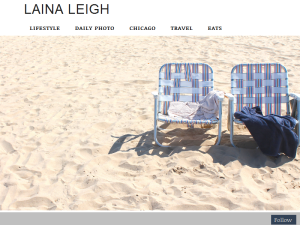 This what your LainaLeigh Blog Ad will look like to visitors! Of course you will want to use keywords and ad targeting to get the most out of your ad campaign! So purchase an ad space today before there all gone! If you are the owner of LainaLeigh, or someone who enjoys this blog why not upgrade it to a Featured Listing or Permanent Listing?